Dino-mite! Greg and Meredith Tally. We've all met a kid with dinosaur fever, the kind who wears T. rex pajamas while playing with a plastic velociraptor. Now imagine that kid as an adult and hotelier. That describes Greg and Meredith Tally, owners of Denver's Best Western Southwest. 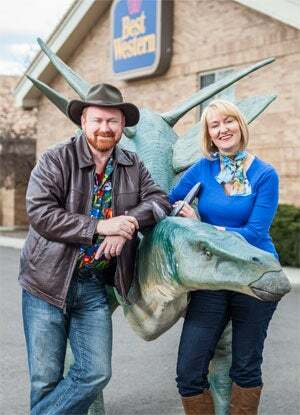 They're putting the finishing touches on a $3.5 million dinosaur-themed remodel of their 112-room hotel, complete with life-size models, displays and, eventually, a muraled swimming pool. "Hotels have to refresh every five to seven years," Greg says. "We were about a year overdue, and we were just going to do a generic remodel." The science lover was out fossil-hunting when he had his light-bulb moment. "Why don't we turn the hotel into a working extension of the [Morrison] Natural History Museum?" he thought. "We're only 10 minutes away from Dinosaur Ridge, the historical site where the stegosaurus, allosaurus and all the big sauropod dinosaurs were first found." While the hotel is one of a kind, quirky makeovers are not unusual for Best Western, which likes franchisees to express their local pride. "As a brand, we encourage it. It's always been in our DNA, and our diversity of product has always been our strength," says Ron Pohl, senior vice president of member services and brand management. He says Best Western has hotels in castles and caves, one that overlooks a drive-in movie screen, one with a Grand Canyon theme and thousands of other unique properties. But he admits the Tallys' project is special: "The extent that they've gone to emphasize their passions and be first-class is remarkable." We asked the Tallys to give us a tour of their prehistoric property. Meredith: We could have just remodeled in a generic way, but this time around we wanted to put our mark on the place and express our passions, personalities and values. And quite honestly, it wouldn't have been as much fun doing a regular remodel. Will visitors sit on plastic rocks? Greg: No, it will be very tastefully appointed. There is going to be warm wood, leather sofas--a very masculine presence. You know, some places put out Frederic Remington statues. We're putting out allosaurus skulls. It will be a low-tech but very interactive museum experience. Meredith: We're going to do the classic Victorian progression, starting with the Archean [age], then wind up the stairs and through the hallways doing each age, all the way up to the Holocene and modern times. This is not just a surface treatment; we want a place where people can come and learn. It's not just replica fossils and life-size dinosaurs. We're telling the story of the discoverers at Dinosaur Ridge and the Bone Wars that followed. The characters on the human side are just as fascinating as the ancient life. Greg: We want to celebrate the area and what makes it special. This place is our brand. We feel we're doing something that has never been done. Where do the Exhibits come from? Greg: Some we're buying, some we're borrowing. We're creating symbiotic partnerships with Dinosaur Ridge and the Morrison Natural History Museum, which will loan us temporary and permanent exhibits. Meredith: They all have way more stuff than they could ever show. We want them to think of us as an extension of their exhibit space. Greg: They thought we were nuts, but we've brought them around. We have an amazing staff; the majority have been with us for two to 10 years. They don't always understand our crazy dreams and schemes, but they're always supportive. In fact, our GM, Kelly Weger, is a very good bluegrass player, and he's writing an album about the Bone Wars that will be part of the ambience in the lobby. We're really just curious people following our dreams and turning a profit doing it. We're marrying pie in the sky with pragmatic reality. You're always lucky if you can find a good medium between the two.